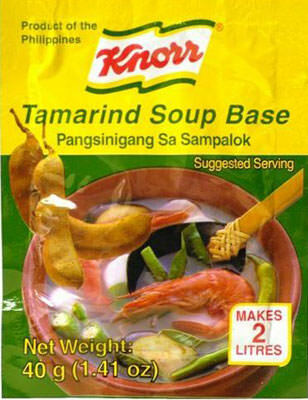 This tamarind product is used to make various Southeast Asian sour soups. Ingredients: salt, citric acid, msg, tamarind powder, natural flavors, onion powder, tomato powder, partially hydrogenated palm oil, shrimp powder, spices, disodium inosinate and disodium guanylate. Product of Philippines.